Hmm, I don't even remember when I last made a substantial post. Maybe on my anniversary, which was a week or so ago. Oh yeah, and I griped about the construction on Saturday. Let's see, in between there, I got really busy again at work - thus the lack of posts - and not much else happened, that I can recall. (Unless you want me to talk about American Idol. Which I don't think I want to do right now, but could probably be persuaded later, if there is interest.) Friday I left work early but I think I did boring stuff like get my glasses fixed and enter things into MS Money. So that gets us up to Saturday and the construction. I did stay home Saturday, but the flip side of that was that since I was home, I convinced Rob that we needed to go out to eat somewhere reasonably nice as a late anniversary dinner. So we went to Landry's. I had filet mignon and he had stuffed flounder and lobster bisque for an appetizer. It was a very nice dinner. I haven't been in there in a while, I forget how nice the atmosphere is. We thoroughly enjoyed it. 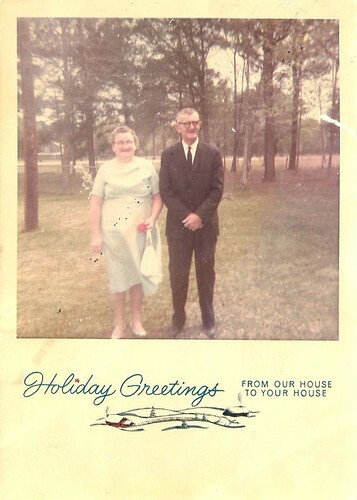 That is my dad's Aunt Ida and Uncle Jack (in 1967, according to the back of the card) - he is definitely getting these because I only ever met them a couple of times and although I remember that I thought they were nice, that isn't enough to give me any great sentimental attachment to this picture. That one is not surviving the weeding process; it's interesting enough to scan but not interesting enough to keep the paper picture. and now I am sleepy so I will spare you the account of the stomach ailment I have had since sunday night, at least until later.